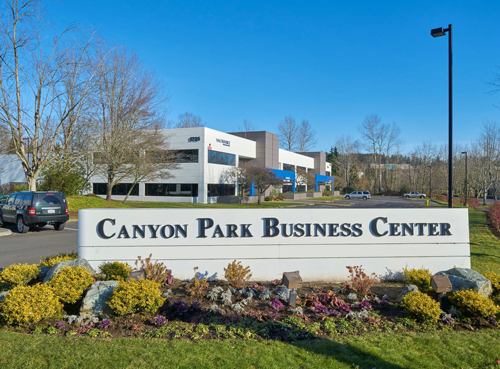 A joint venture between PCCP LLC and SteelWave has acquired Canyon Park Business Center, a 17-building, 632.6k sf property in Bothell, a city situated on Seattle’s Eastside. The property is 99% occupied and consists of 13 Class A flex/office buildings totaling 451k sf, and a collection of four net-leased, Class A, life science lab and data center buildings totaling 181.6k sf. The seller was a venture of SteelWave and Colony NorthStar. Built between 1985 and 1997, Canyon Park Business Center is located at 1631, 1629, 1725, 1930, 1916 220th Street SE; 22121, 22125 17th Avenue SE; 22118, 22122, 22030, 22026, 22025, 22021 20th Avenue SE; 22522, 22333, 22515, 22422 29th Drive SE in Bothell, a main hub of life sciences and medical research in the greater Seattle area. The property is situated at the intersection of Interstate 405 and the Bothell-Everett Highway. Eleven of the 17 buildings within the property are situated at the front of the business park at the interchange of I-405 and Highway 527 which is a highly desirable location due to the visibility and proximity to the surrounding area’s amenities. The property provides tenants with directly adjacent retail and hotel amenities, an adjacent park and ride, three on-site cafes and an on-site LA Fitness. In addition, the property is one mile from Centennial Park, a 54-acre wildlife park, and Thrashers Corner Shopping Center, a high traffic, grocery-anchored retail center with more than 35 retailers.